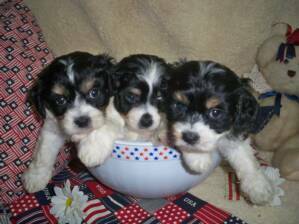 Three Oaks breeds top of the line first generation Cavachons. At Three Oaks Farms, we believe that a dog is a man's best friend. Our beloved dogs are our family members and treated with love and respect. We pride ourselves in breeding happy healthy puppies and vastly separating ourselves from the ill treatment of the puppy mills. Due to the higher outputs and less than desirable conditions, you may find cheaper Cavachon puppies, but they do not receive the high level care and attention that we provide. We proudly stand behind our 15 year reputation as a Cavachon breeder. We are F1 breeders, meaning our puppies are the result of breeding two purebred dogs. These hybrid dogs are less likely to suffer from genetic defects compared to purebreds. We specialize in breeding and raising toy and standard size Cavachons, though on occasion we also have Cavaliers and Bichon Frise puppies available. 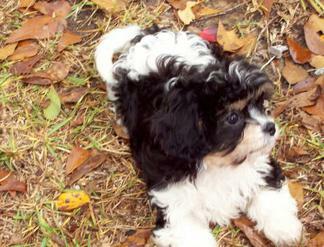 The toy size Cavachons will be 9 to 14 lbs full grown, while the standard size Cavachons will be 15 to 25 lbs. Healthy puppies need a healthy and happy mother. Our mommies have the best of care and love at Three Oaks. The parents are specially selected for their temperament. From the womb to our nursery, we ensure your little one has everything they need to thrive and be healthy. We know how important the first few weeks of life are for a puppy. We acclimate the puppies to family life by keeping them safe in our home. At 6 weeks old, we provide the first puppy shots and deworming. We start potty training after the age of 6 weeks old. We are involved from play time to nap time to feeding time and back to play time again! Each and every day our puppies are receiving training and top notch care. On the day of arrival, your puppy will have a shot record, a health guarantee of 72 hours, and a five year genetic guarantee. If you need to transport your puppy through the airlines, we offer a shipping nursery care pack. Our puppies can go to their new forever home at 8 weeks old.